One of the most highly sought after coins is the Gold Eagle Coin. This American Eagle coin is highly appreciated and demanded on the market due to its outstanding design, along with its high gold purity content. Produced for the first time by the United States Mint back in 1986 in response to the Gold Coin Bullion Act of 1985, the Gold Eagle Coin quickly became one of the most popular gold coins amongst passionate collectors. 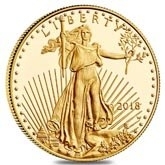 These remarkable US gold coins are still being produced today and are available in three options: Brilliant Uncirculated Gold Eagles, Proof Gold Eagles, and Certified Gold Eagles. Brilliant Uncirculated coins have no wear marks on them and are shipped directly from the mint while Proof Gold Eagles are struck twice to give them a shinier and more detailed look. Certified coins are graded by professional coin grading companies and usually have premiums that are higher than Brilliant Uncirculated (BU) gold coins. 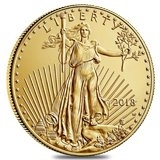 Gold American Eagle bullion coins are produced in several weight types; 1/10 oz., ¼ oz., ½ oz., and 1 oz., with face values ranging $5, $10, $25, and $50. 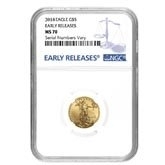 The Brilliant Uncirculated versions of this famous coin are some of the most traded and sought after on the bullion market, while certified and proof gold eagles are preferred by savvy investors. The value of the Gold American Eagle coins is based on its precious metal content, which, by the law, is made of .9167 gold, 0.3 silver, and .5333 copper, that was added to obtain a more durable coin. The purity of this coin is guaranteed by the United States Government. Each year, over 1 million Gold American Eagles are produced and sold on bullion industry markets. 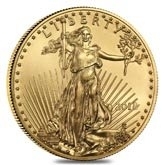 The price of a Gold American Eagle coin depends on its year of issue and its availability on the market, as well as its condition. 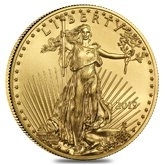 Usually, the Gold American Eagle coin price carries reasonable premiums over the gold spot price. Many investors and collectors buy Gold American Eagle coins to diversify their investment portfolio and protect their savings from inflation. These coins are IRA-eligible, which means that you can choose to have them as your retirement option. The design of the Gold American Eagle is different on both reverse and obverse sides of the coin and feature different images than the Silver American Eagle. This beautiful coin showcases the remarkable design of the first Gold American coin minted in 1907, making the Gold American Eagle an easily identifiable precious gold coin for numismatists. The obverse side of the coin features a full-length Lady Liberty in the foreground. She has flowing hair and is confidently striding forward, while holding a torch in her right hand and an olive branch in the left hand, representing enlightenment, peace, and victory. She is encircled by stars that represent the fifty states and with sun rays in the background, along with the inscription ‘Liberty’. The image was designed by Augustus Saint-Gaudens’ and is considered to be the most beautiful coin design in American coinage history. In the background to the left, the U.S. Capitol building is displayed. On the reverse of the coin, an American Bald Eagle is depicted flying over to his family while holding an olive branch in his talons. This representation of the United States’ national symbol of patriotism and freedom emphasizes the importance and strength of the American family. The reverse design was created by the famous sculptor Miley Tucker-Frost, known as Busiek. The reverse side also contains the ‘United States of America’, ‘In God We Trust’, “E Pluribus Unum’, weight and face value inscriptions. If you have questions about the beloved Gold American Eagle Coin, please feel free to contact us at 800.852.6884. You can also reach our friendly and helpful Bullion Exchanges customer service associates online through the use of our live chat feature, or by email at info@bullionexchanges.com.